All rights reserved, No part of this publication may be reproduced, stored in a retrieval system, or transmitted in any form or by any means, electronic, mechanical, photocopying or otherwise, without the prior permission of the copyright owner. Applications for such permission, with a statement of the purpose and extent of the reproduction, should be addressed to the Director, Information Division, Food and Agriculture Organization of the United Nations, Viale delle Terme di Caracalla, 00100 Rome, Italy. This paper is intended as a technical reference for all Fisheries Administrators. It is hoped that it will contribute towards efforts to implement coastal and offshore fisheries management schemes using appropriate strategies of monitoring, control and surveillance (MCS) wherever they are needed. Mr Peter Flewwelling is President of Ocean Resources Limited, 29 Crimson Drive, Lower Sackville, Nova Scotia, Canada, B4C 3L2. Special thanks are given to the staff of FAO who took time and effort to offer their advice and experience in the design and review of this paper. Further, thanks and sincere appreciation for the support and assistance from the official reviewers from the South Pacific Forum Fisheries Agency; the Organization of Eastern Caribbean States; the Seychelles Fishing Authority; Mr. Winston Miller, the Chair of the Belize Fisheries Advisory Board and former Fisheries Administrator; and to Peter Derham, a well known fisheries manager with extensive international experience. My thanks go also to the Canadian International Development Agency (CIDA), the International Centre for Ocean Development (ICOD) and Roche International for permission to use their graphics and materials from other projects. Finally, my sincere appreciation to all those unofficial advisors who took the time to review and offer advice during the development of this paper. FAO Fisheries Technical Paper No. 338. Rome, FAO. 1995. 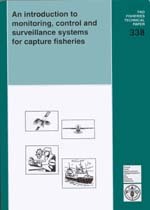 217 p.
The paper has been designed as a handbook for Fisheries Administrators (a term used to denote those fisheries authorities responsible for decisions regarding the fisheries of their country) for their consideration when establishing, or enhancing, monitoring, control and surveillance (MCS) systems in support of fisheries management initiatives. The paper is divided into three main parts: definition and context of an MCS system; design considerations for MCS; and, MCS operational procedures. Annexes provide detailed examples of operational issues to be addressed in MCS system design and implementation.